The IMAG5-1350 is a magnetic mount antenna designed for mobile deployment or for quick field pop-up and deploy applications. 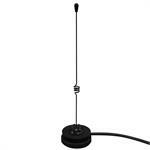 The antenna uses a colinear 17-7 stainless steel black powder coated whip. Integral to the base is a 2” (5.1 cm) diameter black disk.